Scott Condon/The Aspen TimesTom Waldeck says a dispute with a neighbor over a trail leading to a high-country pasture puts his cattle-ranching operation in Emma in jeopardy. EMMA – Tom Waldeck would rather be a cattle rancher than a developer, but the direction of his 137-acre spread in Emma is in a judge’s hands. 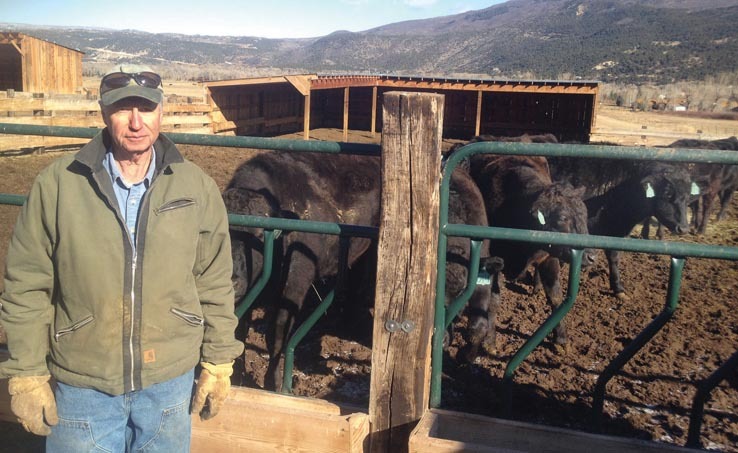 Waldeck purchased the former Cerise ranch in Emma in 2003 and expanded the historic cattle-ranching operation at what is now known as Emma Farms. He leases land back to Rory and Lucy Cerise, who maintain a mixed-breed cattle herd in partnership with Waldeck. Waldeck also added an interesting twist by starting a herd of Japanese wagyu cattle, prized by high-end restaurants for their Kobe beef. Emma Farms straddles the Pitkin-Eagle county line near the bend in Hooks Lane and Emma Road. Waldeck obtained approvals for seven house sites from the two counties, but he has sat on the development plan. Being in agri-business all his career, he came up with a viable alternative when he got into the wagyu cattle, which sell for more than other cattle and, thus, make the ranch operation sustainable. Waldeck initiated discussions with the Pitkin and Eagle county open space programs to preserve the bulk of his ranch. “I hope that no homes ever get built on this property,” he said. A dispute with a neighbor threatens to throw a wrench in the plan. Waldeck and Cerise require use of about 300 yards of a trail and rough road through the neighboring Happy Day Ranch to get Cerise’s cows and calves up to a summer grazing allotment on The Crown, public land administered by the Bureau of Land Management. Ginny Parker, whose family owns the Happy Day Ranch, dedicated the trail to the Pitkin County Trails and Open Space program with the provision that no motorized uses be allowed. The trail, dedicated to the memory of Parker’s daughter, is open to the public for hiking and horseback riding. In May 2010, Parker had her attorney send Waldeck a letter demanding he stop using motorized vehicles to take his cattle up to The Crown and to care for the herd during the summer. Parker also told Waldeck he couldn’t unilaterally close the trail while he was moving cattle. “Failure to agree to the conditions stated herein will result in the revocation of the permissive use of the trail and vigorous enforcement of trespass laws,” the letter said. Waldeck believes the Cerise family, and its predecessors, established the legal right over several decades to use the trail without Parker’s permission. When discussions between the neighbors failed, Waldeck felt he had to respond to the Parker letter with litigation to maintain use of the trail. “The issue is very simple: The trail has been used by one family – that we can document – since 1917,” Waldeck said. Cerise, 53, said he has been personally moving cattle up the disputed route for about 45 years. “All we want is traditional use of the land,” he said. His grandfather obtained the grazing permit on The Crown in 1944. Cerise family relatives, the Vastens, used the high summer pastures for decades before that. Cerise uses a motorcycle or all-terrain vehicle to move the cattle up in the late spring and to travel up as necessary to attend to the various chores of a cattle operation: mending fences, delivering salt blocks, looking after sick calves and whatnot. Cerise also said he traditionally uses the route to go hunting in the fall. He doesn’t go with a large hunting party. It is usually him and sometimes his dad, he said. When on a motorcycle or all-terrain vehicle, Cerise can cross the dispute route in less than one minute. The trail runs up a gully, out of sight of Parker’s nearby house. Noise is baffled by the canyon walls. Parker stated for a story earlier this month that while she initially wanted to prohibit all motorized use of the trail by Emma Farms, she softened her stance. She agreed to allow vehicle use for five days to move cattle. She declined to allow use of the trail for hunting. She wanted her legal fees paid by Waldeck and a promise that he wouldn’t sue in return for “conditional, consensual use” of the trail. Parker said her parents, who bought the property in 1954, maintained control of the use of the trail and road. It can be revoked, she said. Waldeck and Cerise countered with a proposal that would allow them to use the trail for no more than five minutes per day and no more than 10 hours of cumulative use annually. No agreement could be reached, even after the issue went to mediation. Both Parker and Waldeck said they want to avoid litigation, but both feel boxed in. Parker wants peace and serenity on the property. Waldeck said the trail plays a critical role in his ranch operation. The short stretch of trail is an “umbilical cord” that connects the ranch to its summer pasture, according to Waldeck. He said he isn’t using the possibility of development as a threat. It’s reality, he said, that elimination of the use of the trail makes the ranch unsustainable as a cattle operation. Development of the seven lots would be one of few options remaining. Cerise said he doesn’t want to lose ranching as his lifelong livelihood. No trial is scheduled yet; both sides are collecting their facts. Barring a late settlement, a judge will decide the fate of the land in the heart of Emma.